The tracking force is the downward pressure that is applied by the weight of the tonearm through the cartridge stylus and onto the vinyl record. It is important to set the proper tracking force in order to maximize the playback performance and to reduce the risk of mistracking or causing excessive record wear. Check for the manufacturers recommended settings for your stylus tracking force. 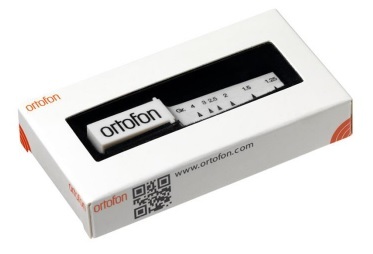 The Ortofon tracking force gauge tool is a small plastic pivot type scale that will accurately measure tracking force between 1.25 g and 4 g.
The Ortofon stylus force gauge is simple to use. Very gently, rest the cartridge stylus (needle) into the grooved guide track at the desired tracking force marking. Next, adjust the counter-weight or tonearm pressure dials until the Ortofon pivot scale is in balance. 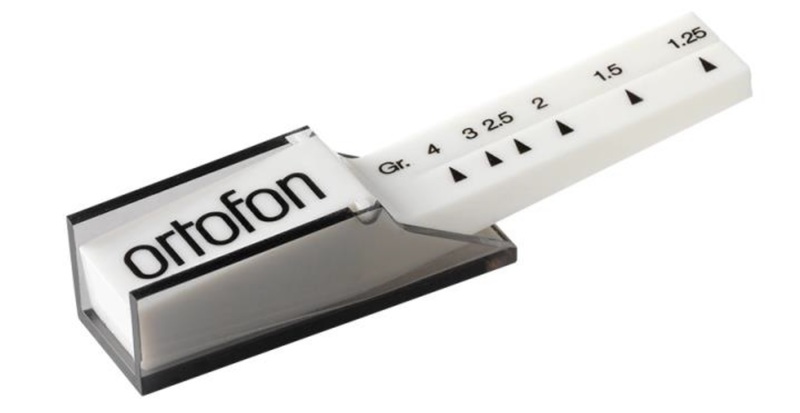 The scale on the force gauge is marked in gram.